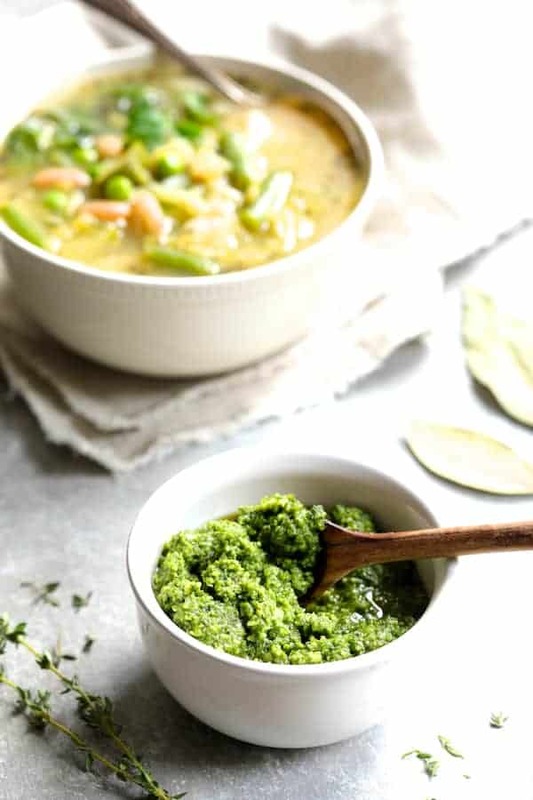 Green Minestrone with Radish Greens Pesto is a healthful taste of spring! A twist on classic Italian minestrone, this version has lots of spring vegetables which will make transitioning from cold weather to warm weather easy and delicious! Friends! Does spring know how to play with a person or what? There are those beautiful bird-chirping sunny days that make you want to run out and play. Then, winter comes right back with cold, cloudy and rainy (or snowy!) days that make you want to hunker back down in front of the fireplace in a thick sweater. 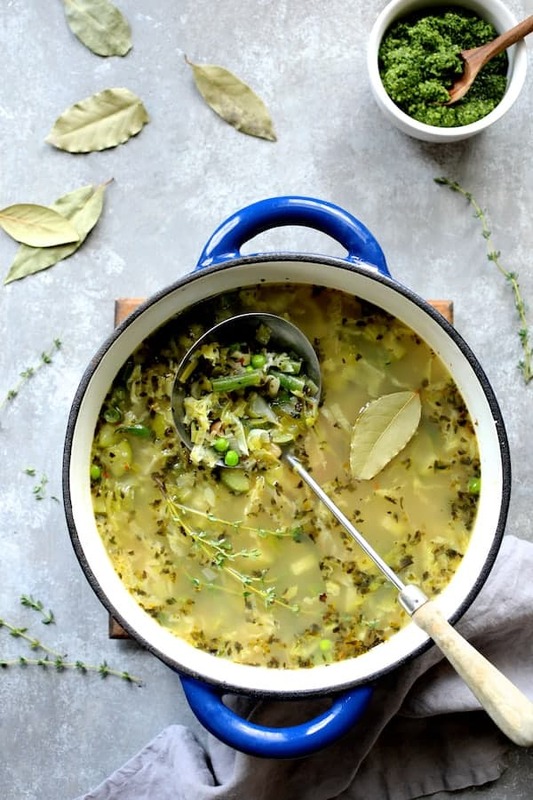 Here’s a soup recipe that’s perfect for this time of year and we’re really going green! Green Minestrone with Radish Greens Pesto! Green Minestrone with Radish Greens Pesto is a twist on classic tomatoey minestrone. This soup delivers a good dose of warmth which is perfect when the weather is still chilly. However, it’s light so it’s just right for a spring lunch or dinner. This version of minestrone is loaded with green vegetables so if you’re hit with any late winter–early spring crud like I was a few weeks ago, it’s got tons of green vegetable goodness to help you recover. 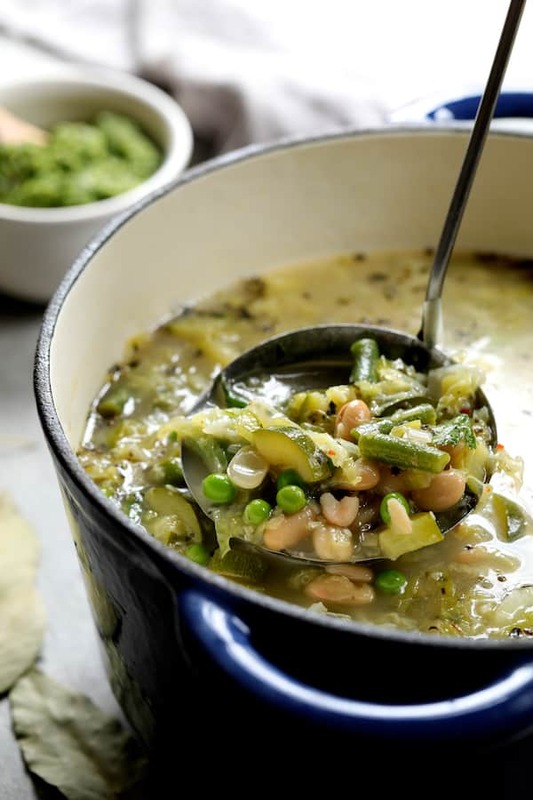 This super soup has leeks, celery, zucchini, green beans, cabbage and peas for the green goodness and white beans for a good dose of fiber to make it more filling. If you can, use fresh herbs. Good fresh herbs have been a little hard to come by even here in the southern U. S. so I’m chomping at the bit to get out and plant my herb garden! To give this soup a little extra “zing,” I like to serve it with my Radish Greens Pesto. A basil, kale or arugula pesto would be just as amazing in this soup! 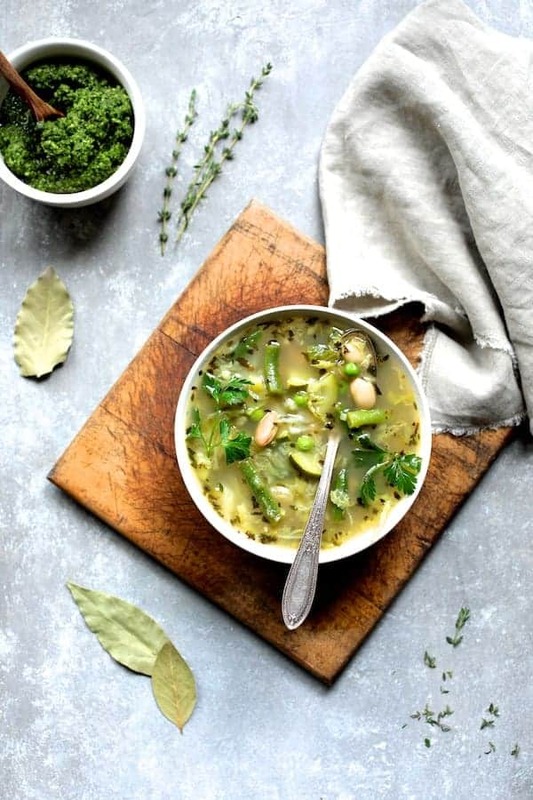 Green Minestrone with Radish Greens Pesto for a healthful taste of spring! 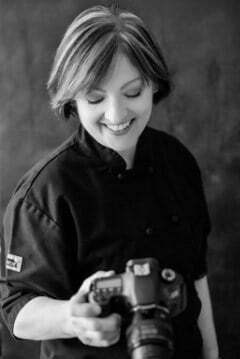 Be sure to try my other delicious, comforting Italian-inspired soups! 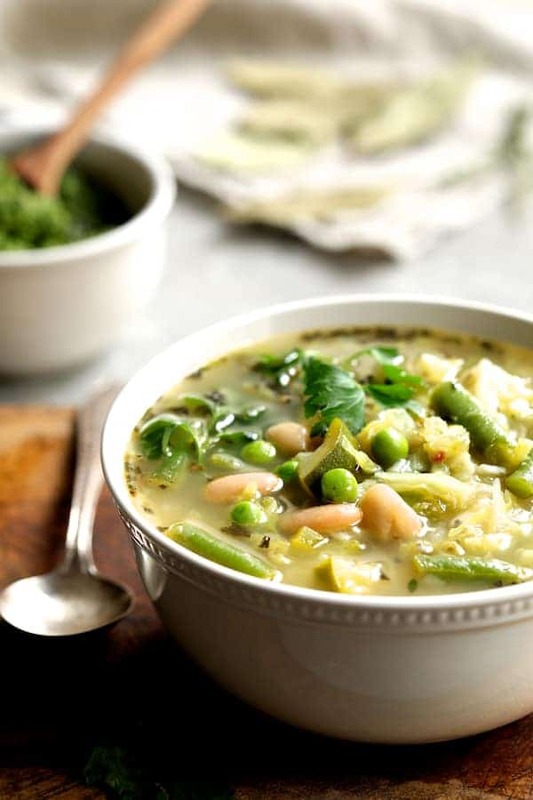 Green Minestrone with Radish Top Pesto is a healthful taste of spring! A twist on classic Italian minestrone, this version has lots of spring vegetables which will make transitioning from cold weather to warm weather easy and delicious! Heat olive oil in a Dutch oven over medium-high heat. Add the leek and celery, reduce heat to medium and cook 7 to 8 minutes or until vegetables are softened. Add garlic and cook 15 seconds or until fragrant. Add vegetable broth, bay leaf and thyme sprigs. Bring to a boil. Add zucchini, green beans, cabbage, beans, basil, oregano and crushed red pepper flakes. Reduce heat to low, cover slighlty and cook 20 minutes or until vegetables are tender. Add peas and parsley and heat through. Add salt and pepper to taste. Top with a dollop of Radish Greens Pesto. Thanks, Michelle! I think I love radish greens pesto more than basil because it stays beautifully green! This soup looks so good. I have only ever tried a classic minestrone soup. I would devour this!! Thanks, Cathleen! It’s really good and was just what we needed for those chilly spring evenings!